Having a father who grew up in the restaurant industry and multiple family members who have owned and managed restaurants, it’s no surprise that Angie Mar fell in love with the art of cooking. “When I was younger, I was like 6 or 7 years old, I would go into my mom’s room and the magazines that I would take off of her nightstand were Vogue, Gourmet and Food and Wine, which kind of tells you like where my head has always been at,” Mar told ABC News’ Chief Business, Technology and Economics correspondent Rebecca Jarvis on an episode of the “No Limits with Rebecca Jarvis” podcast. While it may seem obvious that Mar was destined to grow up to work in the culinary industry, an outward passion wasn’t always evident, but the desire to make money was. At the age of 18, she decided to drop out of college and enter corporate America. “I got done with high school early, I dropped out of college and I was just like, ‘I want to make money.’ That’s all I was concerned about,” Mar explained of her decision. After spending 10 years in corporate real estate, and building a career that looked nearly perfect on paper, Mar decided to leave her job and take some time to find her true passions. While traveling in Spain she discovered her love for cooking and spent all of the money she had to move from Los Angeles to New York City. She started culinary school and worked full time in a variety of restaurants. “I grew up in the kitchens that were hard kitchens. I was shucking oysters and peeling onions for a year, and sweeping the floors and making minimum wage and that’s where I started. And I had never been so happy. It was like, I definitely made the right decision,” Mar described of the experience. Mar trained at a multitude of restaurants under a diverse group of chefs. “I wanted to learn how to butcher so I went to go work for Andrew Tarlow at Reynard and learned everything about butchering. I wanted to learn how to run a Michelin-starred restaurant, so I worked at The Spotted Pig when it had its Michelin star,” Mar said. After a couple of years, Mar became the executive chef at The Beatrice Inn, and two and a half years into her role, she was offered the opportunity to purchase the restaurant. “I said ‘no’ when they offered it to me. 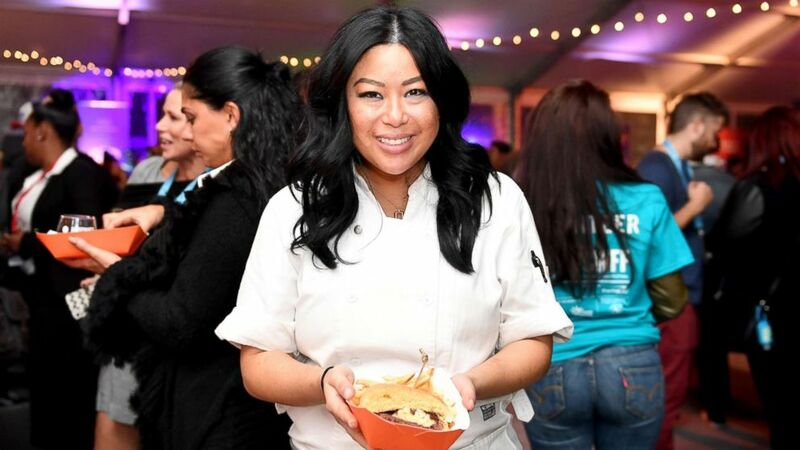 I was like, ‘You’re crazy, I don’t want it.’ I’d been the chef there for two and a half years at the time, and I felt like there was so much negativity surrounding that restaurant,” Mar explained of her situation. Angie Mar attends Edible Schoolyard NYC 2018 Spring Benefit at 180 Maiden Lane, April 16, 2018, in New York City. The Beatrice Inn has been around since the 1920s, starting out as a speakeasy, transitioning into an extremely exclusive nightclub owned by then-Vanity Fair editor Graydon Carter, and eventually turning into a red velvet rope-type of place when Mar was on staff as chef. Even though Mar originally said “no” to purchasing the space, she decided to give the idea a bit more thought. “If we could buy this restaurant, return it to the neighborhood and have it be this really beautiful neighborhood gem and write a new chapter, a more welcoming chapter, it was going to be the best comeback story ever in restaurants,” Mar explained of her decision. After purchasing, Mar closed the doors to take time to think through the menu and revamp the interior. While many tried to give their opinion on what she should serve and how she should run it, Mar stayed true to her original ideas for the spot: serve meat and serve it well. “I’m not going to have anything for everybody, because I don’t have to, because my food speaks so true to who I am,” Mar said of her decision to not serve chicken and fish at the chophouse. Mar has now been managing The Beatrice Inn for over two years, but that doesn’t mean her schedule has lightened up. Mar works seven days a week, mostly 17- or 18-hour days, and the fire is still very much alive. “If I had slowed down before I was an owner, before I had the chance to buy a restaurant and really start building my brand, I wouldn’t have actually been able to make those things happen,” Mar said. Listen to more of this interview with Angie Mar on the “No Limits with Rebecca Jarvis” podcast on iTunes, Stitcher, TuneIn or ABC News Radio.